UPDATE: A more recent and thorough analysis can be found here. When posting anything on social media, whether a news article, a picture of yourself, or a funny image (or a combination thereof), you usually want to reach the largest audience. 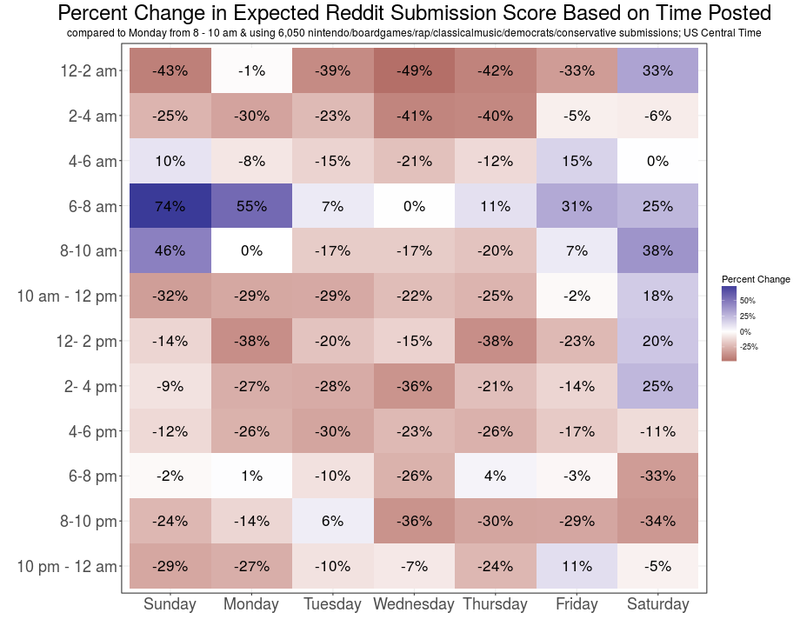 When posting on Reddit, I have noticed that the success of a post is largely determined by the time of day and day of week that your submission is posted. There are a few other factors, such as whether the post is an image, an article, or a text-only submission. I log-transform the score on the left side. Doing so ensures that the terms on the right side have a multiplicative effect on the score, as opposed to additive. The right side treats the time of day + day of week, the post being an image post, and its other attributes as independent factors that each scale the score by some value; i.e., I am controlling for other effects. Below is a graph that estimates the effect of the time of day and day of week on six different subreddits I sampled collectively. I use Monday from 8 to 10 am as a reference, so the percentages are the percent increase in score you can expect if you post at the given time versus Monday from 8 to 10 am US Central Time . Monday morning is a relatively good time to post in these subreddits, especially from 6-8 am. Sunday is even better during that time frame, with an expected score that is 74% higher than our reference, Monday from 8 to 10 am. Saturday, however, seems fairly strong most of the day. Because the above image only applies to a relatively small amount of data, it helps to compare it to a different set of data. 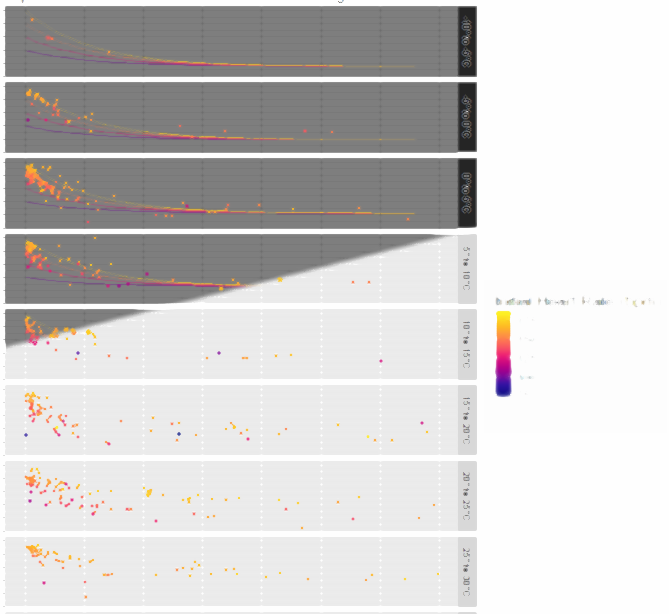 Below I sampled default subreddits, as well as thread commenter's comment histories, so this model generalizes to Reddit as a whole better. This tells a similar story, except the tiles change a lot more smoothly. 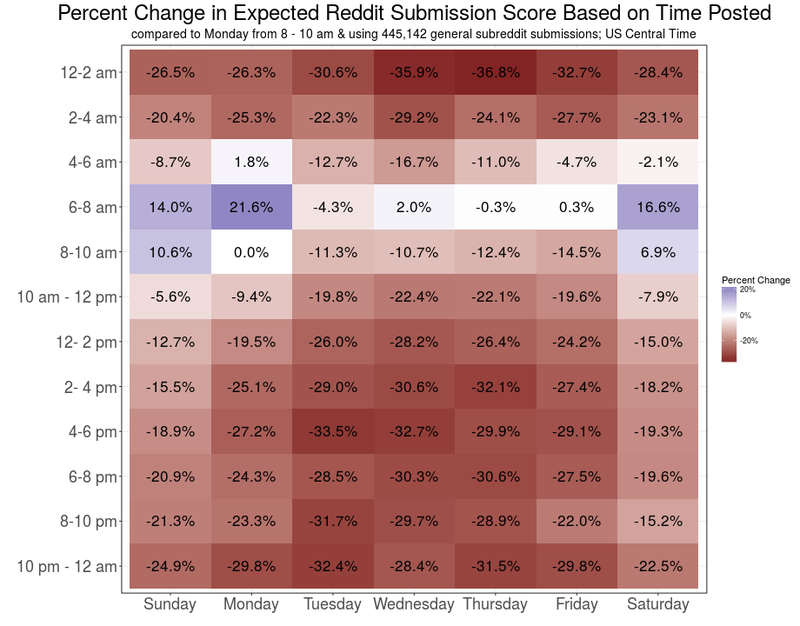 You could repeat the process, but the general takeaway is that the best time to post on Reddit is on Sunday, Monday, or Saturday from 6 to 8 am US Central Time. The next best times would be within 2 hours of that time range on those same days, or during that same time range on other days. Technically, the transformation I made to the score adds 1 to the score before calculating the percent change, and negative scores are calculated as having points equal to 1/(1+abs(score)) , which is a fractional score always decreasing as the score becomes more negative. Below I have the R code I used to generate the images. You can download the data for the file here: constrasts_threadmode.csv. Whitewater rafting is a fun, but potentially dangerous activity. 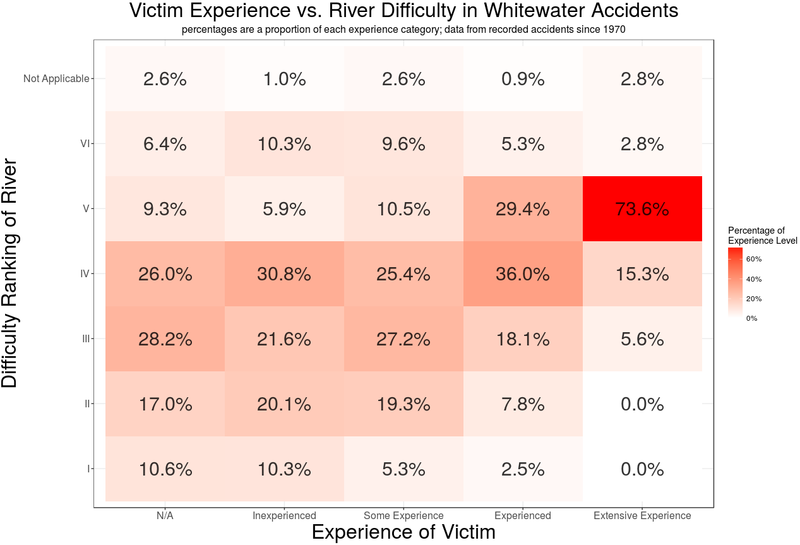 In this article, I look at the experience level of victims, the difficulty of rivers they traverse on, as well as some of the causes/contributing factors to these accidents.